Not to be completely basic by sharing a homemade guacamole recipe the day before Cinco de Mayo but it’s happening and I’m too busy stuffing my face in this glorious bowl of guac to be mad about it. Join me! 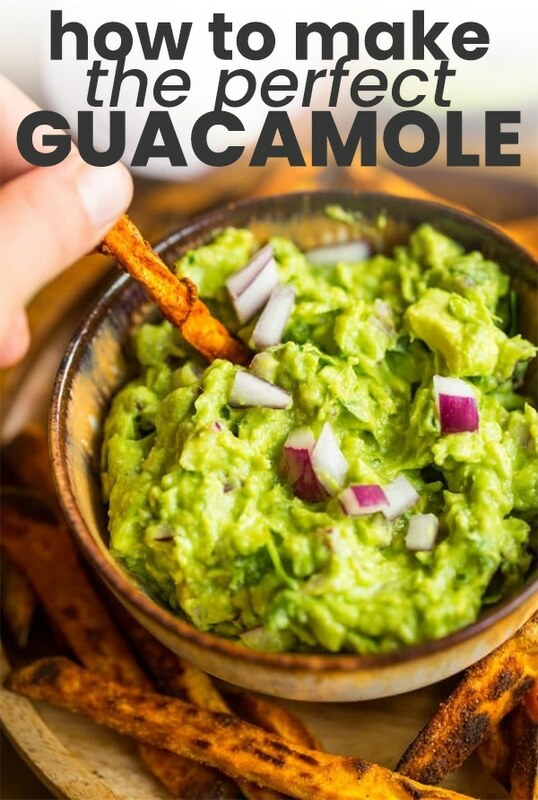 Seriously though I’m not even sure how I have yet to share a single standalone homemade guacamole recipe in all of the nearly 400 recipes I’ve shared here on A Saucy Kitchen. Criminal. Better late than never, I suppose! Ideally you wanna use the standard Hass avocados – they’re the darker, pebbly skinned avocados that you typically see in the grocery store. 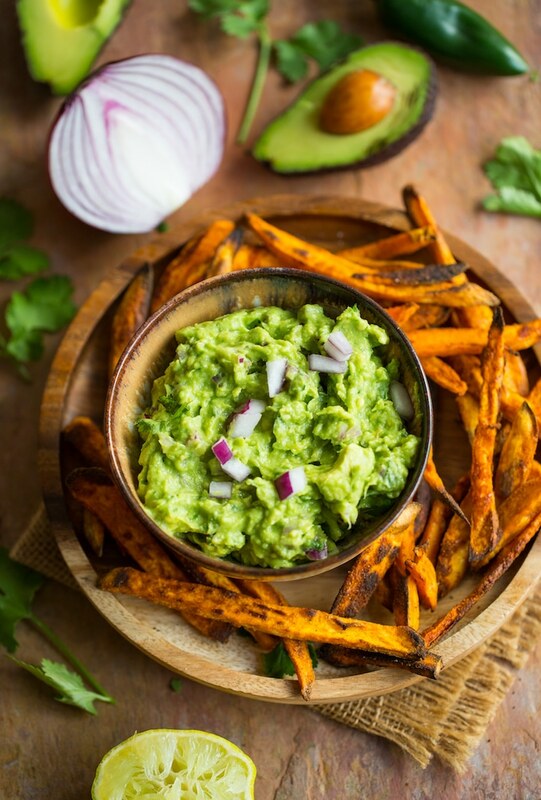 Hass are the best type of avocados for guacamole because they’re more creamy in texture making it ideally for traditional guacamole. When the avocados are firm, but yield to gentle pressure they are ripe and ready to go. If they feel mushy then they are too ripe and will likely be brown and stringy on the inside and if they feel hard to the touch they are still too unripe to use. Lime juice can really make or break a proper guacamole. If you’re really in a pinch and don’t have any limes on hand you can sub it out with lemon juice or even a red wine vinegar. I’m personally not a huge fan of tomatoes in my guac. I just find that it can get a little too messy and watery in addition to only being really viable during the summer months. That being said, if tomatoes are more your thing than go for it! Just make sure to try to drain away as much liquid as possible before adding it to the rest of your ingredients. I know that cilantro is one of those love or hate things. There’s even an entire website dedicated to uniting cilantro haters world wide. If you’re firmly in the I-hate-cilantro camp then you can totally swap it out for another herb of your choice: parsley, basil, mint, chives….whatever. You do you. 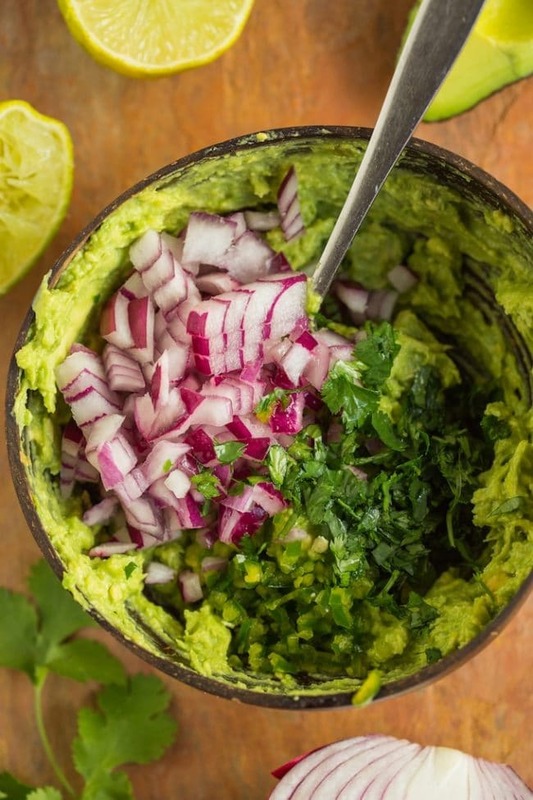 Otherwise cilantro is really want you need for a classic guacamole. On to the seasoning! A little extra salt can go a long way to make a so-so guacamole go from a 6 to a solid 10. Start off with a little than add more as you taste and go. Traditionally, guacamole is made with sweet, white onions. That being said you can just use whatever you have on hand or whichever you prefer. I’m personally all about the sharpness of a red onion, but this isn’t a component you need to overthink too much! Once exposed to air, avocados begin to oxidise and turn a sad, mushy brown. This process is inevitable but there are a few things you can do to slow that progression. Seal in plastic wrap. Smooth out a sheet of plastic wrap over the guacamole making sure that it’s got full contact over the dip. The idea here is to create a seal between the guacamole & air to keep it from turning. I haven’t actually tried this one out yet myself but I’ve seen a few people recommend smoothing out the surface of your guacamole in its storage container and then adding a small layer of water over the top before covering with a lid and storing. Again, this is another way of keep the air away from the guacamole. Just pour off the water for using and that’s it! If you like sour cream some people spread a layer of that over the top before covering storing. Bonus: Now you’ve got a two for one dip. Also, did you know that you can freeze guacamole? Just pack it up in a ziplock bag and pop it in the freezer for up to 3 months. When you’re ready to go just take it out of the freezer and let it thaw for about 24 hours in the fridge before using. If you’re in a hurry you can defrost in about 45 minutes before placing the sealed guacamole covered in a container filled with cold water until it softens up. All this being said, the real key to making the perfect homemade guacamole is just to make what you want! Play around with what you have in an go crazy with it because we all like different things. 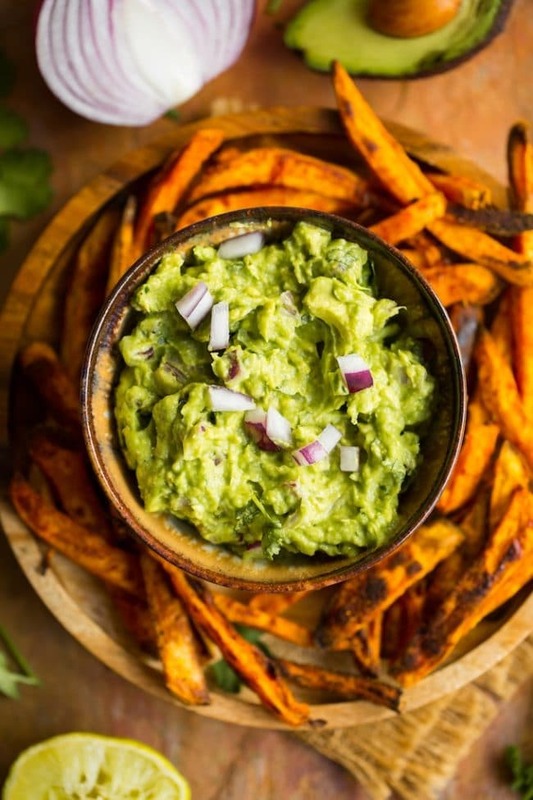 Don’t forget to #asaucykitchen on instagram if you try this Homemade Guacamole Recipe! We love seeing what you make! You can also post your pictures to my facebook page! Mix in the remaining ingredients until combined. Taste and season with additional salt and lime juice as you see fit. To store: transfer the leftover to a small, fitted container. Cover with plastic wrap making sure to press the plastic to whatever exposed surface of the guacamole you can see. Cover with the lid and then keep store in the fridge for up to 3 days. Wanna make a meal out of it? 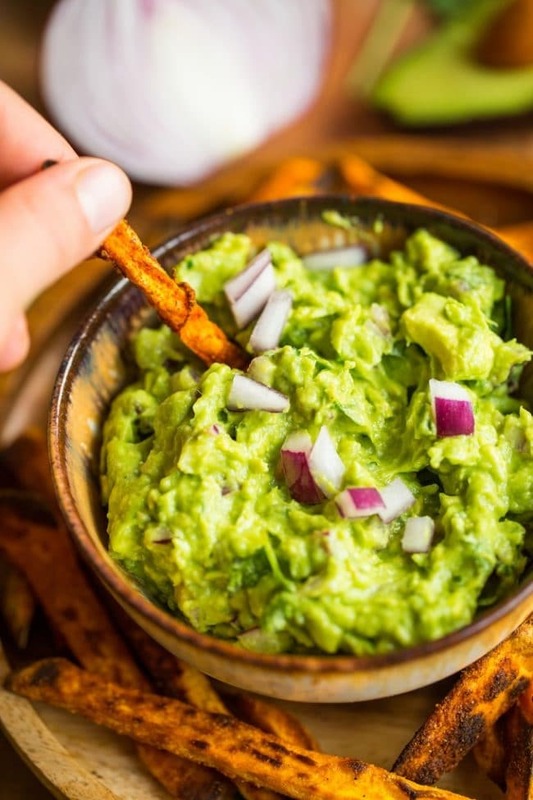 What are your best guacamole tips and tricks?? This is my go to guac! Thanks for the recipe!